There is a different kind of snow falling in California right now. It might look vaguely like that cold stuff that has been falling back east, but the resemblance stops at "white". 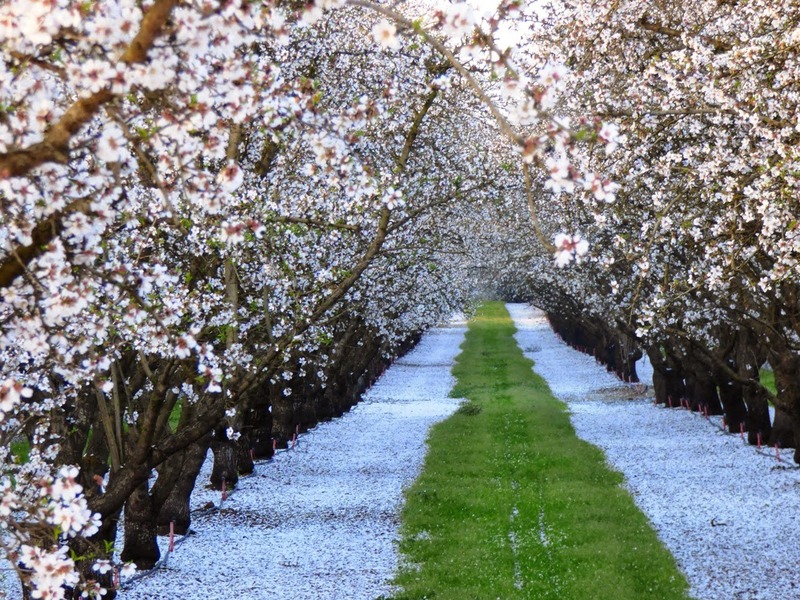 The almond orchards of the Great Valley have been blooming for the last two weeks or so, and the flower petals are starting to fall to the ground as the buds break out into an explosion of green (green leaves now, and green piles of money later). 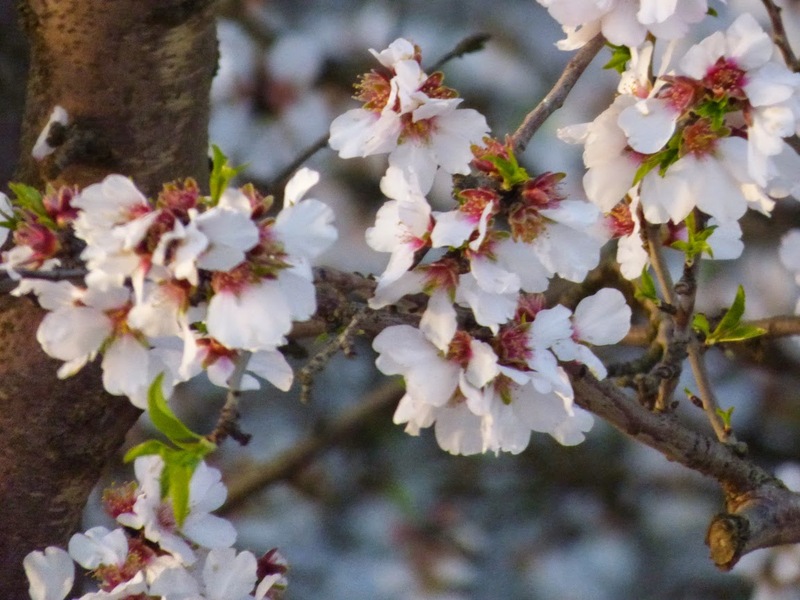 The almond blossoms are one of the earliest fruit and nut trees to bloom. The pink peach blossoms are just getting started. Things look great right now. The valley floor is green with grass and the ground is moist, because here in the valley, our rainfall totals are actually ahead of normal in some places. In Modesto so far this year, 10.70 inches of rain has fallen, when 8.45 inches is normal. Last year at this time, we had received a paltry 3.26 inches. So this is good news, right? Not really. 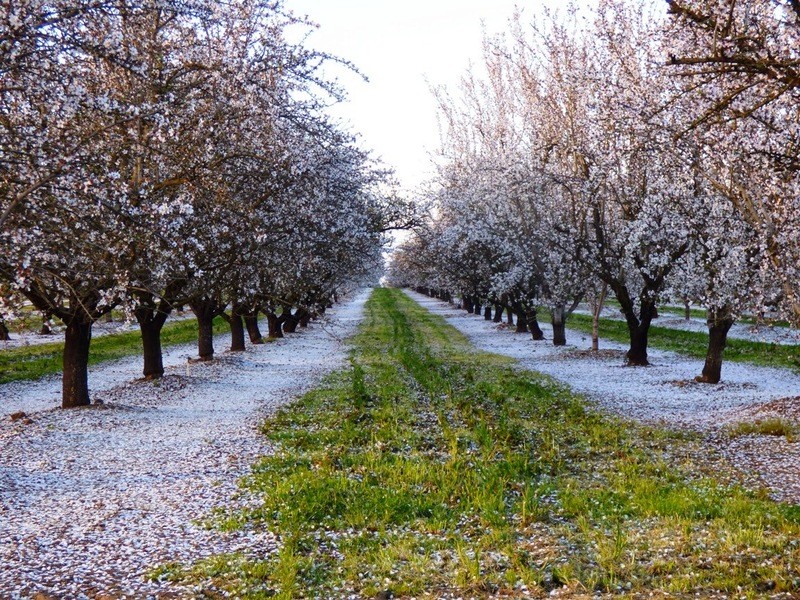 It's good that the orchards didn't need a February "drink" from the irrigation system. It's good that the ranches in the foothills have some of the best grazing conditions in a couple of years. But it won't last. The normal rainfall in our valley was not matched by normal precipitation in the Sierra Nevada, and that is where the precipitation counts. The snowpack in the Sierra is barely a quarter of normal right now, meaning very low runoff in the spring, and almost no irrigation water available for the hot summer months. We are in a world of hurt. The state is in the fourth year of drought, and there are just not a lot of alternative sources of water to fall back on. We've used way too much groundwater, and it isn't being replaced at all. What are we going to do? These are hard questions, and they will have to lead to some hard choices. In the meantime, I'm going to enjoy my very colorful commute through the blooming fields and orchards. Spring is always a time of hope and rebirth, and there are still six or seven weeks left in the rainy season. Who knows what could happen? Isn't that the great conundrum this year in California? It's so beautiful right now. Great weather. Wildflowers on green hillsides. It's hard to enjoy it without feeling guilty, though, knowing the snow packs are low again and we're looking at a long, hot, dry summer ahead.